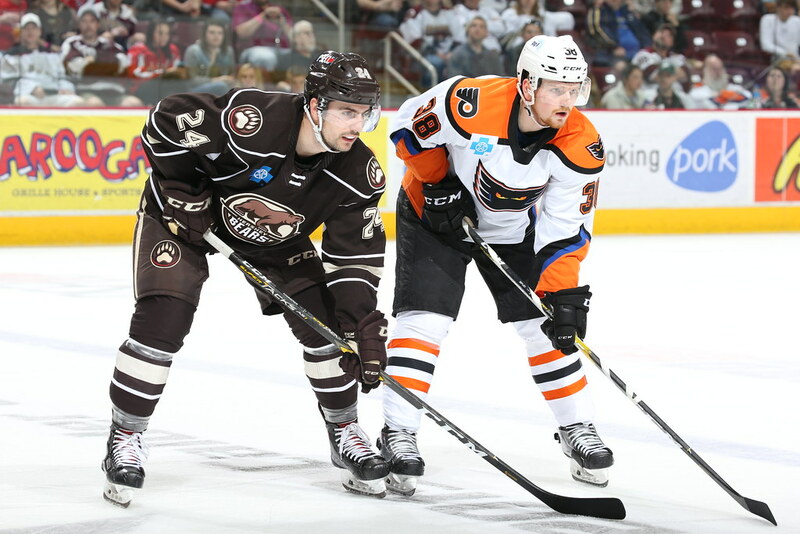 The Hershey Bears fell to the Lehigh Valley Phantoms 3-2 (OT) Tuesday night at the Giant Center in Hershey. The loss drops the Bears record to 40-25-4-4 (88 points) on the season. The Bears begin their final weekend of the regular season this Friday when they visit the Wolf Pack in Hartford. Puck drop is set for 7:15 PM. The Bears and Phantoms skated to a scoreless first frame. Hershey outshot Lehigh Valley 10-6 for the first 20 minutes. There were no power plays in the first period. The Phantoms would start the scoring with a goal from Carsen Twarynski at 2:58 of the second period. Twarynski would get behind Aaron Ness and win the battle for the puck, then go high blocker side for the games first tally. The Phantoms would make it 2-0 with a shot from the right side by Colin McDonald at 7:36 of the middle frame. McDonald would beat Vanecek glove side. The second period would conclude with the Phantoms holding a 2-0 lead. The Bears outshot the Phantoms 12-11 for the middle frame, and led 22-17 after two periods of play. The Bears 0 for 2 on the power play. The Phantoms did not have a power play in the first two periods. The Bears would cut the Phantoms lead to one with a goal from Beck Malenstyn at 3:25 of the final frame. Aaron Ness (46) and Dylan Stemen (1) were credited with the assists. The Bears would tie the game moments later with a power play goal from Max Kammerer at 5:58 of the final frame. Joe Snively (2) and Ryan Sproul (19) had the helpers. This was Kammerer’s second goal in as many games. Lehigh Valley would get their first power play of the game with less than two minutes remaining in the contest, but during the man-advantage, the Phantoms would take a holding penalty, nullifying their short-lived power play. Regulation would end tied 2-2. The Phantoms would win it with 1:32 remaining in overtime. Connor Bunnaman would pot the game winner. Bears go 6-4-1-1 in the season series with Lehigh Valley. Bears outshot Phantoms 32-28 for the game. Ryan Sproul would lead the Bears in shots with 7. The Bears were 1 for 5 and the Phantoms 0 for 1 on the power play. This was Connor Hobbs 100th AHL game. This entry was posted in News and tagged Beck Malenstyn, Hershey Bears, Jon Sorensen, Lehigh Valley Phantoms, Max Kammerer. Bookmark the permalink.